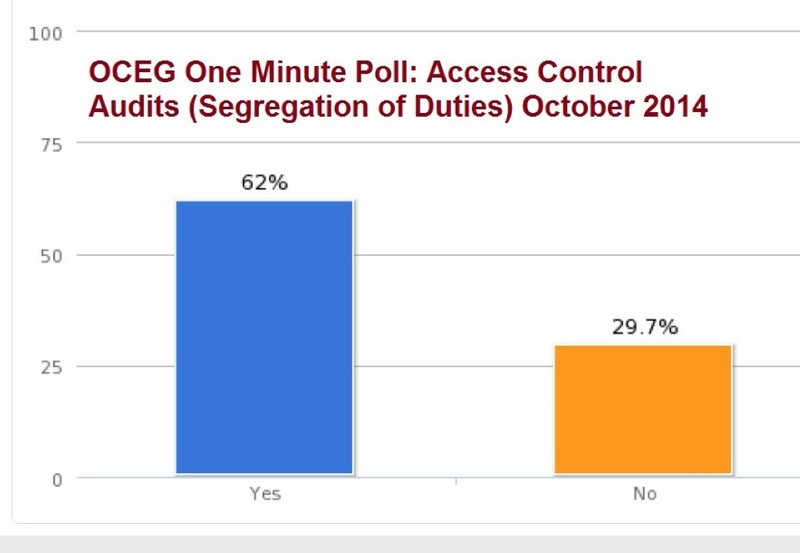 This brief survey, on Access Control Audits and Segregation of Duties was conducted in October 2014 and had 5 main questions answered by over 400 GRC professionals. Does your organization periodically perform an entity-wide Segregation of Duties (SoD) or Access Audit? How many individuals are involved in designing, conducting and/or analyzing your SoD or Access Audit? How many total man-hours are needed to complete each SoD or Access Audit? We have emailed instructions to access Survey: OCEG One Minute Poll – Access Control Audits (Segregation of Duties) October 2014 to . Make sure the email arrives in your inbox: either add "support@oceg.org" as a safe sender to your email platform, or if you use Gmail, drag our email into your Primary tab.